Pulling double duty is no problem for this versatile heart design chrome finish wine pourer/stopper from Fashioncraft's own Vineyard Collection. With prominent interlocking hearts at its top, this sleek and light weight favor, makes a tasteful addition to any love filled occasion. 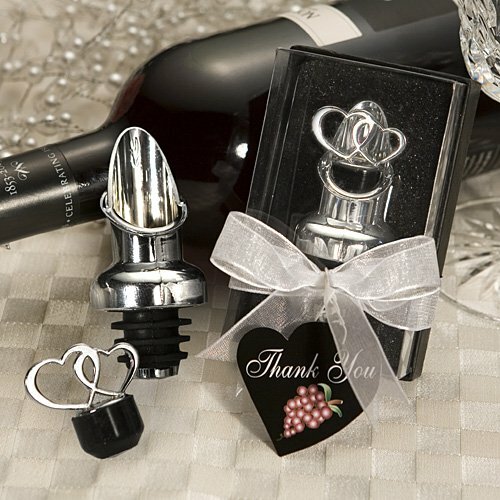 A great choice as wedding favors that are sure to be an often used accessory in your guests' homes., each chrome finish wine pourer/stopper features a double heart top stopper with a rubber for easy lift off. The stopper is nestled within a drip proof pourer. Each favor measures 3 inches x 1.5 inches x 1.5 inches and comes individually packaged in a deluxe box with clear top and black bottom tied with a white satin ribbon and attached thank you tag.